Enhance Windows Clipboard with multiple snippets, secure storage and full-text search. Hot CopyPaste works in every program supporting Windows Clipboard, and works in many that don't. Cut, copy and paste as many snippets as you need at once! 1ClickScreenshot allows you to create screenshots without using Photoshop or MS Paint. It loads immediately and allows you to create a screenshot in under a second even on older computers. This is all due to the program's very small size. . . The fastest and easiest way to capture images from your computer screen. 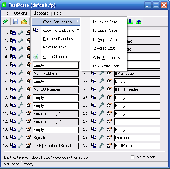 The captured screen can be saved to disk as a file in 6 different graphics file formats. From time to time you may need to save anything you copy to the clipboard as files on your hard drive or upload it to Goole Web Albums or Google Documents. This utility will do such job for you. ClipTorrent is an advanced clipboard extender and utility program with an 18 language spell checker. .
ClipTorrent is an advanced clipboard extender and utility program with an 18 language spell checker. Paste & Save is a handy little utility that can save pieces of text on the Clipboard for reuse, before you accidentally overwrite it. An application which can save you time by removing unwanted formatting information when pasting text in Windows. Quick Texts is an utility to speed up your editing process when using a lot of Copy & Paste operations of same texts. Visual Clipboard is FREE, simple and quite useful clipboard manager.